UPDATE 2: If you have 05.13 baseband or lower - do not update to 4.2.1, use PwnageTool to create custom firmware! 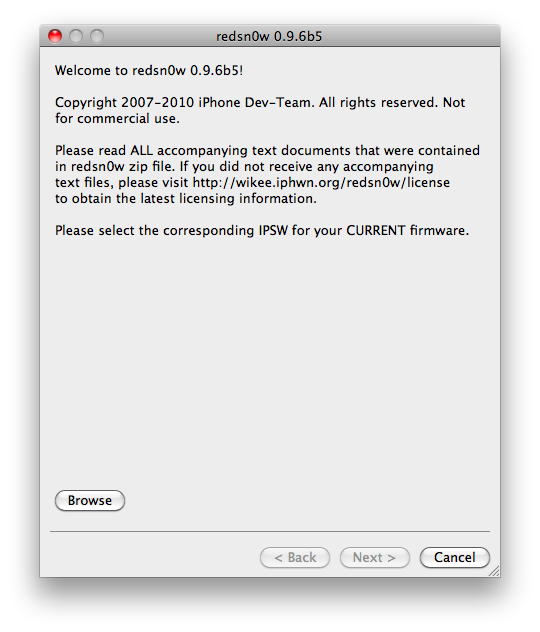 This is step-by-step instructions on how to jailbreak and unlock your iPhone 3G on iOS 4.2.1 firmware using RedSn0w 0.9.6b5 for Windows. For iPhone 3GS use this tutorial. The iPhone Dev-Team has released RedSn0w 0.9.6b5 for unlockers stuck at the 05.14 or 05.15 basebands. The new redsn0w 0.9.6beta5 is out. It gives both Windows and OSX users the ability to flash the iPad 06.15 baseband on iPhone3G or iPhone3GS. It fetches the baseband files directly from Apple for now (the only IPSW you ever point it at is the stock IPSW for the FW on your iPhone right now). There may be a long delay while it’s doing this (their servers are currently getting pounded). Windows 7 and Vista users, please run redsn0w as Administrator in "XP Compatiblity Mode". We will soon post step-by-step tutorials. 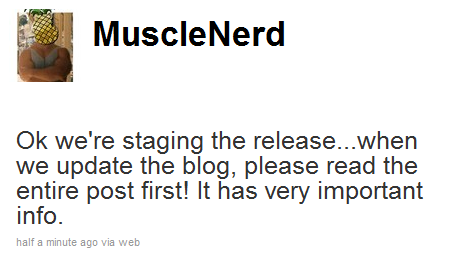 This is the tweet from MuscleNerd posted a minute ago. So it is just minutes to wait for new unlock utility ultrasn0w. UPDATE: New ultrasn0w released! New PwnageTool 4.1.3 released. Read carefully this post from DevTeam first, then reread again! MuscleNerd previously announced that the ultrasn0w unlock should be available by Sunday for the iPhone 3G and iPhone 3GS. The unlock for the iPhone 4 will take much more time. 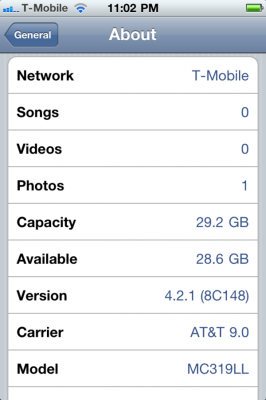 UPDATE: this is not a reason for update to iOS 4.2.1, wait for utilities. DevTeam hacker MuscleNerd tweeted that they after releasing redsn0w jailbreak for 4.2 the team can start working on iPhone unlock. Users can expect the unlock for the iPhone 3G and iPhone 3GS this week. The iPhone 4 unlock will take more time and no concrete info is available about that yet. 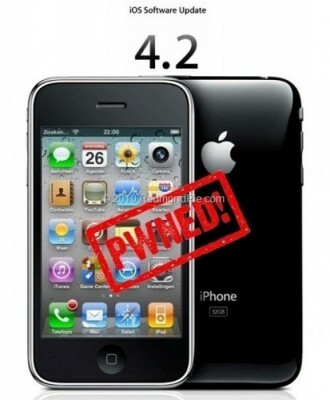 The ultrasn0w unlock will be released for iOS 4.1 firmware. So is you need unlock, do not update to iOS 4.2.1. DevTeam worked hard for the last several hours and released jailbreak tool for iOS 4.2.1. It is redsn0w 0.9.6 b4. As usual we remind all ultrasn0w unlockers please stay away from this official firmware. Wait for the ability to create custom 4.2.1 IPSWs that don’t update your baseband! New redsn0w 0.9.6 b4 uses limera1n exploit and will successfully jailbreak all devices. The only problem is that it is a tethered jailbreak, which means you will have to plug it to a computer and rerun redsn0w on every reboot. This so called tethered or semi-tethered jailbreak. This condition applies to iPhone 3GS (new bootrom), iPhone 4, iPad, iPod touch 2G (MC model), iPod touch 3G and iPod touch 4G. Hackers are working hard to create untethered jailbreak for these devices. To use future untethered jailbreak you need to save SHSH keys for iOS 4.1 using TinyUmbrella utility or directly in Cydia. Old devices like iPhone 3GS (old bootrom), iPhone 3G and iPod touch 2G (non-MC model) can be jailbroken-untethered right now using this latest version of RedSn0w. You can download RedSn0w 0.9.6 b4 here. iOS 4.2 for iPhone, iPod touch, iPad and Apple TV is now available! Download links. Apple recently published a press release stating that new firmware iOS 4.2 for iPhone, iPod Touch and iPad will be available today. Apple® today announced that iOS 4.2, the latest version of the world’s most advanced mobile operating system, is available today for download for iPad™, iPhone® and iPod touch®. 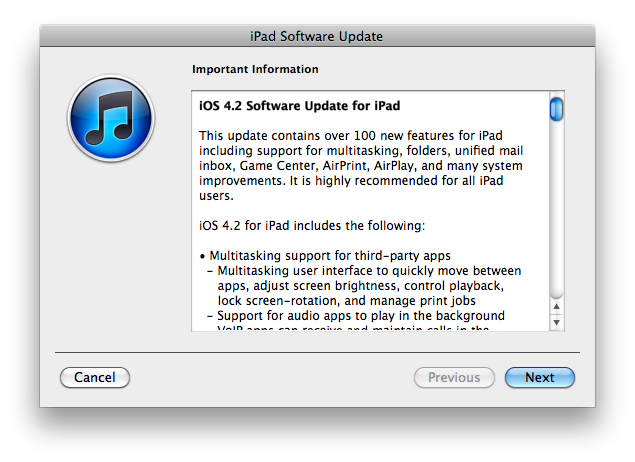 iOS 4.2 brings over 100 new features from iOS 4.0, 4.1 and 4.2 to iPad including Multitasking, Folders, Unified Inbox, Game Center, AirPlay® and AirPrint. However users are unable to update through iTunes right now, as well as there are no download links yet. The expected release time is 10 am Pacific Time. 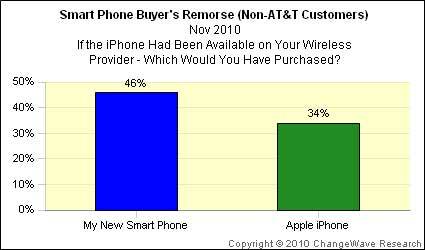 According to a new survey, released this Friday by ChangeWave, every third U.S. smartphone buyer on carriers other than AT&T wishes he could have bought Apple's iPhone. The aim of the survey was to study what exactly smartphone the customers want to buy next time. As it have been revealed many times before, most of the iPhone's owners are happier than any other group of smartphone users as they are "very satisfied" with their purchase. Jailbreak iOS 4.2: what can we expect? Next iPhone/iPod/iPad firmare iOS 4.2 is due out soon. What can we expect in terms of jailbreaking 4.2? Limera1n exploit for 4.2 in most cases is a tethered jailbreak. That means if you have to reboot your device, it will show a "connect to itunes" logo until you run the jailbreak software again. iPhone 3G - will run 4.2 untethered. Redsn0w will be updated. iPhone 3GS - old bootrom will run 4.2 untethered if done via Pwnagetool while updating from 4.1. Otherwise it will be tethered. Tethered jailbreak isn’t that bad for iPads and iPods. But if something happens and your iphone reboots while you’re away from your computer, you cant use the device until you get home and run some tool on your computer again. We suggest not updating until new expoit will be implemented in new utility. The community is working on a solution to this to either make the jailbreak untethered or at least semi-tethered. Semi-tethered means the device will at least reboot, but unjailbroken while on the road until you return to your computer. 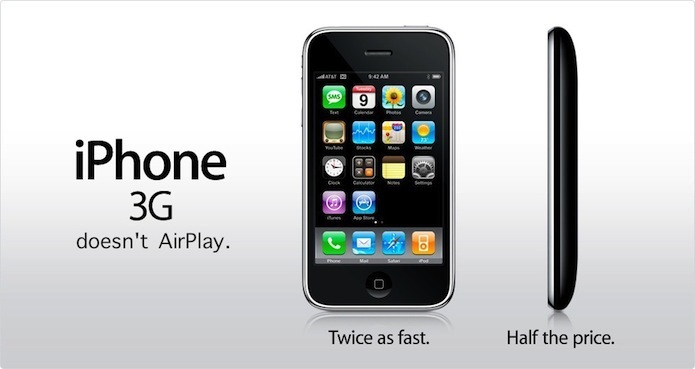 Multiple developers and users testing out the iOS 4.2 betas claim that the AirPlay functionality was definitely removed from Apple’s iPhone 3G. AirPlay is gone from the golden master version of iOS 4.2. In fact, the AirPlay did work on the iPhone 3G at the previous betas. There are no any reasonable causes why the AirPlay was cut from the GM version. Perhaps, Apple is trying to get users to upgrade to their latest iPhone model or, on the other hand, it is just an issue in the GM seed. May be the AirPlay functionality will return in iOS 4.2 public release. Anyway, there will undoubtedly be a jailbreak that can re-enable it. 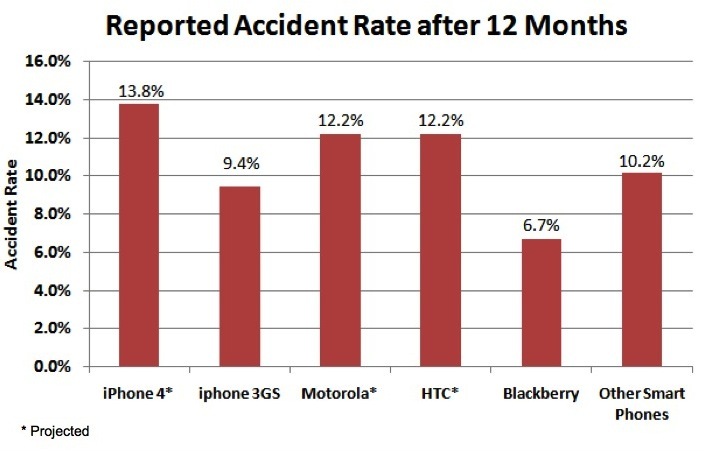 This week third-party warranty provider SquareTrade posted the results of the study of more than 50,000 smartphones, which include Apple's iPhone 3Gs and iPhone 4, Motorola's Cliq, Droid and Droid X, HTC's Nexus One, Droid Incredible and Evo, RIM's Blackberry Curve, Storm and Bold. After iOS 4 release in June, it was laggy and generally not a good experience for many iPhone 3G users. 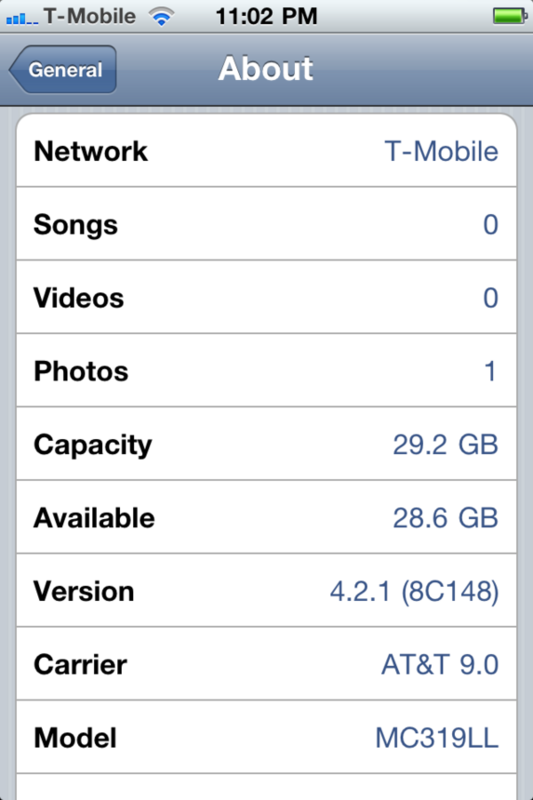 Nevertheless, the due to release iOS 4.2 is running pretty well on iPhone 3G. Here is a video of iPhone 3G running the iOS 4.2 GM version, which is usually identical to the final release. The video was shot by TIPB.com. There were not any significant lags, and the keyboard was responsive. But, as usual, the real problems appeared after some usage time , when you bloat the system with all your email, calendar entries, and vast number of contacts.